Not sure how this depicts The Chariot? Click here. Etteilla: Dissention, War, Dispute, Pomp, Arrogance. Lévi: The Hieroglyph depicts a cubic chariot with four pillars and an azure and starry drapery. In the chariot, between the four pillars a victor crowned. A double sphinx or two sphinxes joined at the lower parts are harnessed to the chariot; they are pulling in opposite directions. Christian: The empire of the world belongs to those who possess a sovereign Mind, that is to say, the light which illuminates the mysteries of life. By overcoming your obstacles you will overthow your enemies, and all your wishes shall be realised, if you go toward the future with courage reinforced by the consciousness of doing right. Illustration (left): The Chariot from Antichi Tarocchi Bolognesi by Giacomo Zoni (c. 1780) (re-published by Lo Scarabeo). Click the image for a larger one. Papus: The Conqueror, who occupies the centre of the four elements (symbolized by the four columns of The Chariot), is the man who has vanquished and directed the elementary forces. Felkin: Here we have a symbol of the spirit of man controlling the lower principles, soul and body, and thus passing triumphantly through the astral plane, rising above the clouds of illusion and penetrating to the higher spheres. Waite: The Charioteer has led captivity captive; he is conquest on all planesin the mind, in science, in progress, in certain trials of initiation. Illustration (left): The Chariot from The Rider Tarot Deck designed by A. E. Waite, drawn by Pamela Colman Smith (1909) (copyright &COPY; 1971 U.S. Games Systems). Click the image for a larger one. Wirth: The Sphinxes, which draw the Chariot, are not separate animals but one single one, a sort of Amphibian with two heads. Such a monster, being able to walk in two directions would become immobile if it were not for the middle part of his body harnessed to the chariot. The triumphant drivers merit is that he was able to harness it, for in this way he utilizes energies which left to themselves can only cancel each other out. Case: The Chariot is truly the House of Influence, and stands for human personality as the vehicle, or channel of expression, through which the omnipresent Self manifests its dominion over all things. 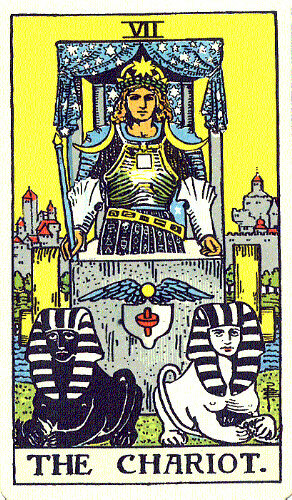 Crowley: The central and most important feature of the card is its centrethe Holy Grail. In the centre is radiant blood; the spiritual life is inferred; light in the darkness. Gray: Conquest, success for those engaged in artistic pursuits, triumph over money difficulties, ill health and foes. Advantage for the seeker will result if he resists his lower promptings and masters his animal passion. It is a card of those who achieve greatness. May also betoken travel in comfort. 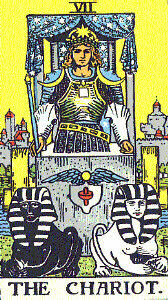 ONeill: To the Alchemist, the Chariot is the stage of Exhaltation, which is clear from the symbolism of the card. The chariot is the body, the horses are the instincts, and the charioteer is the mind. All parts are functioning harmoniously and no reins are needed. The horses pull in different directions so the duality is still present. Yet the mind is master and the car moves forward. 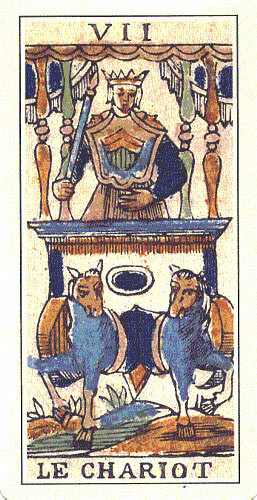 Pollack: The Chariot shows us the developed ego; lessons of the earlier cards have been absorbed, the adolescent period of search and self-creation has been passed, and now we see the mature adult, successful in life, admired by others, able to control feelings, and above all, to direct will. Turk: The Chariot, which is the vehicle of the higher self, is known as the merkabah. It encloses the courageous individual willing to leave the solid ground of habitual belief and ride over the threshold of the cloud of ignorance into the concealed mystery of the unconscious self. Symbol (top): It is a sideview of a chariot drawn by a horse.